I called my mom on my way home from the gym last night. I had just done two classes and wanted to die (not really die, but close). She asked "Do you ever feel like you're doing too much?" I said "Nah, I feel like I'm a badass." I think I can officially claim gym rat status at this stage in my life. I'm there 4 to 5 times a week, sometimes for multiple hours at a time. And I'm sad when I'm going to miss my classes, like next week when I'm out of town for training. But I think what I like most about my gym is that there's no push for you to be anything but you. If you want to push, they'll push you, but it's always what you want out of the class. I think because of that, I push myself that much harder. If I don't come home soaking wet and want to pass out on the floor, I feel like I've done something wrong. Yoga is an interesting practice for me. I tend to like the more athletic classes (spinning, circuit, etc), because at the end, I can feel all the hard work I've done. But I also know that I need yoga to slow me down some, make me breathe and actually think about what I'm doing. I like to feel strong and I haven't always equated yoga with strong. Silly me. I try to do a yoga class once a week. Not mbala where everything is so fast and athletic, but yoga. The kind of class where you spend the first and last five minutes stretching and breathing. My first inclination is to just go and do, but with yoga I've learned to find the calm and appreciate it. The stillness as they like to say. Monday night was pretty big for me. 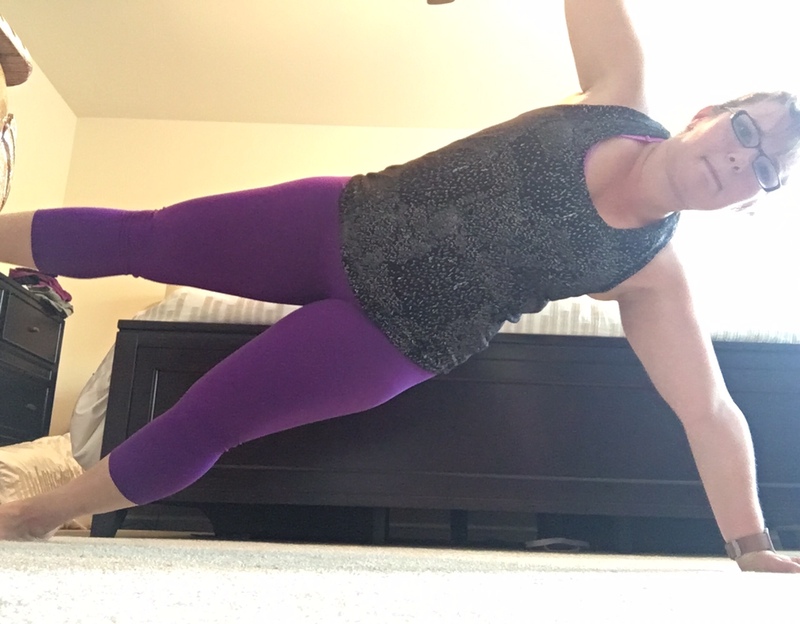 I was able to lift my left leg while doing side plank. That might seem like nothing to you, but for me, it's huge. I have all my weight (and it's a lot) on my feet, arms and core. And now I'm lifting a leg?! What?! It happened because every week, I try to do a little more. Go a little further, lift a leg when I know I can't. Sometimes I fall and then other times, like Monday night, I lift my leg and stay there. And in that moment, you're half shocked that you haven't fallen over and half thinking "This is awesome!" There are few things as cool as knowing that you've gone one step further than where you were before. Recreating my side plank with leg lift in our bedroom before class. They say relax your face. Ha. Sadly, I can only do it on one leg and hold it for any length of time. So I'll keep trying the other leg until I can do that one, too. I'll keep pushing myself to the limit every class because I can. Because I'm only going to get stronger by doing more. I really can't explain how much more confidence you have in yourself when you feel strong. Screw skinny. Strong, that is where it is at. What can you push yourself in? What can you do today to make yourself that much better?